Preheat oven to 220°C. Place the pumpkin, onion, zucchini and garlic in a roasting pan. Drizzle over lemon juice and oil. Season with salt and pepper. To make the stuffing, place the couscous and apricot in a heatproof bowl. Pour over the boiling water while stirring with a fork. Cover and set aside for 5 minutes or until the liquid has absorbed. Use a fork to separate grains. Add the egg white, mint, pine nuts and lemon rind and stir to combine. Place 1 lamb roast on a clean work surface. Cut a horizontal slit from the centre towards the edge of the thicker end (do not cut all the way through). Open so the lamb sits flat. Place half the couscous stuffing along the centre of the roast. Beginning at the thicker end, roll up the lamb to enclose the filling. Use unwaxed white kitchen string to tie at regular intervals to secure. Place on the vegetables in the pan. Repeat with the remaining lamb and stuffing. Season with salt and pepper. Roast in oven for 40 minutes for medium or until cooked to your liking. Transfer the lamb to a plate. Cover with foil and set aside for 5 minutes to rest. Carve the lamb across the grain into thick slices. 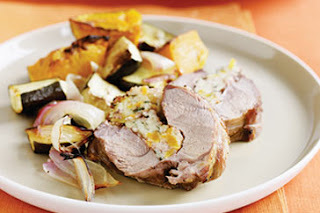 Divide vegetables among serving plates and serve with the lamb.